Double knitting has been on my to-do list since ages. The fact that it produces reversible fabric with reversed colors on either side intrigued me. I knew how it works theoretically, but wanted to try my hands at it. 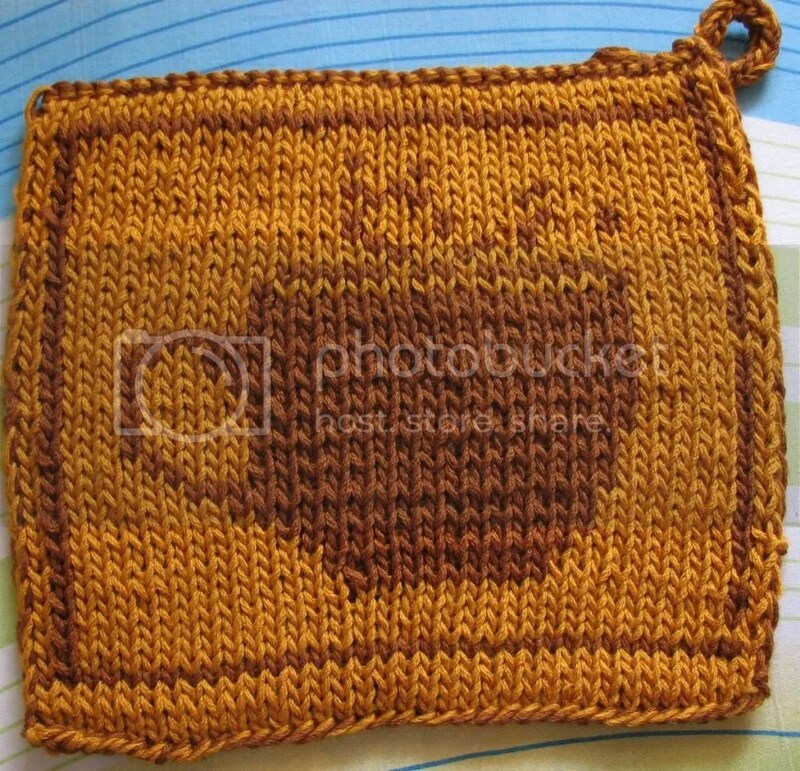 I finished working on Annis and wanted something quick and easy as a filler, so I decided to knit this pretty hotpad. 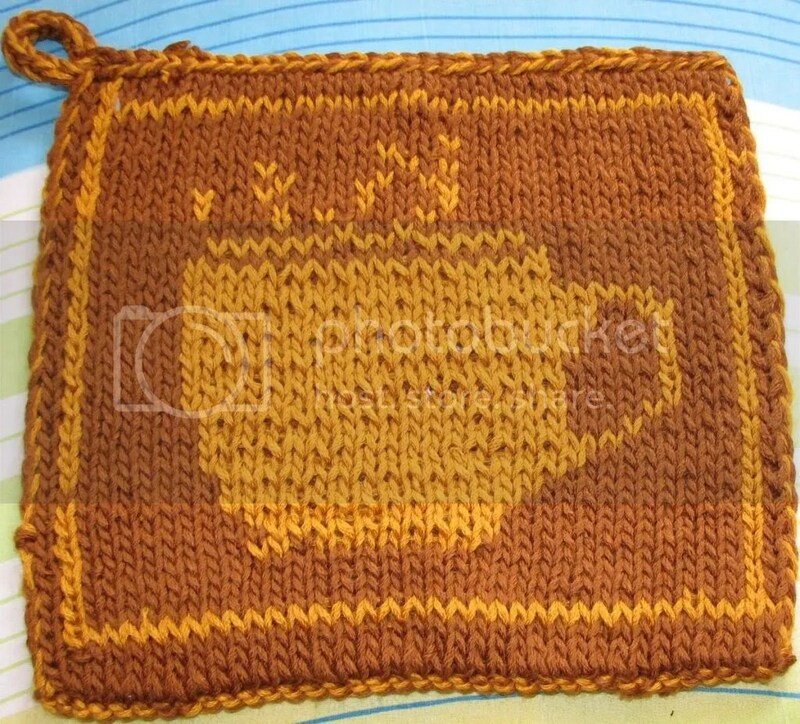 I had some NaturallyCaron’s Country yarn in two shades of brown, which was perfect for this coffee hotpad. I looked at videos explaining how to cast on with two colors alternately. After going cross-eyed watching those videos, I decided to cast on with two strands held together. Clever, eh? On the next row, I treated each strand as a separate stitch, so I had the required stitch count for both colors. It took me some time to get used to holding a strand in both the hands, but once I got the hang of it, it was a smooth sail. Working the chart was very addictive. After completing one row, I would be so eager to work on the next row and the just-one-more-row syndrome made this hotpad a very quick knit. Before I knew it, I was casting it off. To match the cast on edge, I cast off treating two strands as one stitch and knitting with both strands together. The small loop is an i-cord knit using two strands held together and attached to the hotpad later on. The yarn is splitty and was a pain to work with. It was a wrong choice for the hotpad, I wish I had used some sturdy cotton instead. Well, lesson learnt. Double knitting… I haven’t given this technique a go yet, but it looks like loads of fun! Another great project! !